User-friendly, stylish, and quiet operation are some of the adjectives used to describe the Singer One Plus sewing machine by those who have purchased it. Customer reviews have observed that this model, unlike similarly-purposed other brands, goes through thick materials with ease. The most advanced model in Singer’s new line, this model has features that open up more options for the sewer’s creativity. It’s features are often compared to the Singer Stylist 7258 (click this), but to put it quite simply, this machine’s performance and build quality is far superior. To give you a good idea of what it will be like to own a Singer One sewing machine, take a look at some of the features which have made this model a popular choice for both novice and veteran sewers alike. 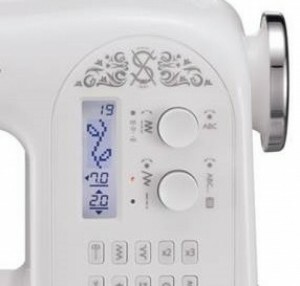 The LCD screen with a dial for stitch selection provides an easy and clear view of stitch settings with the image and number of your preferred stitch as well as the settings for stitch lengths and widths. With the foot control, you only have to press “start” and the machine will start sewing. Slide the lever of the speed control and you get your desired speed. With twin automatic needle mode, you can select the stitches you want that adjust for sewing with twin needle efficiency. Program the needle of the Singer One to stop in its highest upward position for easy fabric removal from the machine. You can also program the needle to stop working in a downward position when you need to do quilting, appliquéing, and pivoting. The 14.7-inch arm of this model provides you with an extra large work area required for home décor sewing, quilting or other projects that need additional space to be worked on. On select stitches, this machine provides you with elongation that can make stitches longer twice or thrice their original length. And with SwiftSmart, threading has never been easier to do. You simply guide your thread from spool directly to needle area through one groove, press the lever, and you’re done. Meanwhile, the specialized top bobbin system is drop-in, eliminating the need for raising bobbin thread prior to sewing. The feed dogs are lowered by a lever as well for when you need stippling, button-sewing, and free motion embroidery. Reduce thread bunching with the presser foot sensor that ensures your sewing has an easy start; a raised presser foot will prevent the machine from sewing. You can also edit and save your combinations of select stitches for creating your own personalized designs and easily set quality decorative and satin stitches for a maximum 7mm width with the automatic tension regardless of fabric type. With a maximum 750 SPM (stitches per minute) and an automatic reverse button to reverse or reinforce stitching sewing, you get maximum results more quickly in no time at all. Tie-off your stitches with three small tacking stitches with one push of the Tacking Stitch Button to reinforce both stitches and patterns to avoid unraveling. Use the button for One Cycle Stitch as an option for select stitches to sew single units of stitches; press this button while sewing a sequence and the machine stops at the cycle’s end. Tapering a zigzag stitch is easy with the Singer One sewing machine because the stitch automatically tapers to center instead of right or left to provide a clean finish as you taper out or into a sewing point. Zippers, top stitching, and cords for projects are easily done by this machine since the needles can be positioned 13 ways. Thread cutting is precise and accurate, eliminating the need for using a pair of scissors. Say goodbye to inferior stitch formation with horizontal threading by this machine. With the thread spool positioned horizontally, the thread feeds more evenly. You don’t need a screwdriver with the snap-on presser feet. Additionally, the presser feet’s pressure against the seven segment feeding system – designed to guarantee that fabric is picked up as well as supported from the presser foot’s back all the way to the back – adjusts automatically for sewing anything from lightweight tricots to heavy denims even without adjusting the pressure level. 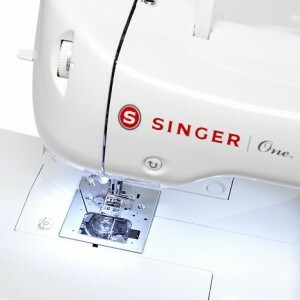 The Singer One Plus is equipped with three “StayBright” LED lamps to illuminate your sewing surface brightly and clearly, with long-lasting light bulbs – with 100,000 hours of sewing capacity – that remain cool regardless of the period in which your machine operates. And the Direct Current (DC) motor instantly starts up and stops without coasting for approximate stitch placement. The free arm of this model is removable and provides easy access for sewing pant hems, collars, cuffs, and other areas which are hard to reach. The metal frame, designed for heavy duty performance, provides rigid support internally to hold and contain all machines aligned perfectly to ensure general durability and sewing quality that is skip-free. Buttonhole Foot equipped with an Underplate. Instruction Manual with Stitch Guide. A long warranty period is a customer’s assurance that the product doesn’t easily malfunction or break down. Beginning sewers will be especially glad to know that they will have their Singer One sewing machines for a long time because this model comes with a 25-year (limited) warranty that includes electronic components (five years) and adjustments (one year). From my experience and from reading online reviews, most customers have been more than satisfied with this sewing machine. Many users often mention that the One Plus is not only easy to set up but is easy to use as well and this I can definitely agree with. A few customers reported that they found the machine larger and heavier than expected. Which not a bad thing; it is actually what you want in a good sewing machine. Although lengthy (more or less an hour) and generic, most people find the instructional DVD helpful. It contains numerous useful demonstrations and tutorials giving an overview of what the machine can do. Some people have reported confusion on the diagrams found in the instruction manual, however I did have the same problem. Maybe we are looking at different versions. Based on my experience and other reviews , there is a general consensus among users that this model is a perfect fit for beginners and advanced users alike. As far as price is concerned, the Singer One Plus sewing machine is a great value for your money because of the numerous features that come with it. Priced a tad bit more than other machines in its class, consider it a long-term investment. After all, its 25-year warranty means Singer is willing to stake its reputation on the One Plus durability and quality performance. 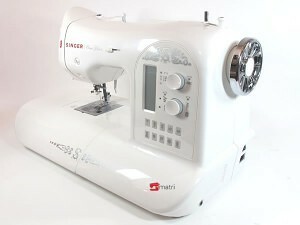 Click here for more information about the Singer One Plus sewing machine on Amazon. 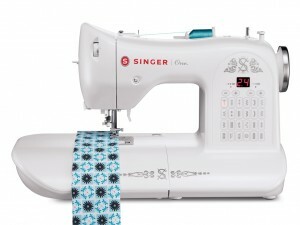 I am new to sewing and I am interested in the Singer one plus machine. Will it work with thick fabric, Like hemming a pair of jeans, especially sewing over already existing seams? The machine I have which was given to me to start on, does not go through thick material. I tried hemming a part of work shorts for my husband and I had to roll the ends over so the ragged edges wouldn’t show. (they were cut off’s) It did fine until it got to the side seams of the pants, with them rolled, it was super thick and the machine couldn’t handle it. Other than that, I want to get good enough to make clothes for my grandson and husband (maybe even myself) and do other projects. If the Singer one isn’t the one, which one do you recommend for a beginner. Hi grandma likes to sew. .
Just wanted to say Thankyou. I am a “grandma I’m waiting”, however I am looking at buying this machine as the one my own grandma taught me on (an old black singer with a foot pedal) has sadly seen its day. Thanks for the review. Has been very helpful & I am reaching for my credit card as this machine is on special locally for 1/2 price. Great to hear, I hope you enjoy it!